Asphyxia injuries are common childbirth injuries that result when an infant does not receive enough oxygen before, during, or immediately following childbirth. Asphyxia can result in cerebral palsy and other brain injuries in the child. Though a child’s asphyxia injuries may be caused by something other than medical negligence or malpractice, such injuries may also occur as a result of inadequate medical care during the mother’s pregnancy or medical negligence during the labor and delivery stages of childbirth or after childbirth. Obstetricians and other medical personnel who assist in the care of a mother during her pregnancy or in her child’s birth have a duty to exercise due care for the prevention of fetal asphyxia injuries by properly watching for, detecting, and monitoring signs of fetal asphyxia, and by managing the condition when it has been discovered to prevent or reduce the likelihood of child injury to the fetus. According to the American Academy of Pediatrics (AAP) and the American College of Obstetrics and Gynecology (ACOG), common indications or symptoms of prenatal asphyxia that physicians need to watch for include an unstable, erratic, or falling fetal heart rate, lack of movement by the fetus, pressure on the umbilical cord, nuchal cord (the wrapping of the cord around the fetus’s neck), complications with the placenta, low maternal blood pressure, and pallor or difficulty breathing in the mother. Fatal as well as non-fatal asphyxia may be caused by medical malpractice during a woman’s pregnancy, during labor and delivery, or following childbirth. If your child has died or been injured through asphyxia either before, during, or immediately following childbirth and you believe the injury or death may have been due to medical negligence, you may be entitled to compensation for the damages you and your child have suffered as a result. Birth injury and asphyxia attorney Jeffrey Killino has extensive experience with all types of birth injury cases, including those arising out of injuries or deaths due to asphyxia. Contact attorney Killino at 877-412-8490 for a free evaluation of your case and more information about your legal options. Medical errors during any of the stages of a fetus’s development, during the delivery and labor stages of the child’s birth, or during the period immediately following a child’s birth may result in numerous types of asphyxia injuries. An obstetrician’s care of a mother and her developing fetus during the mother’s pregnancy may result in asphyxia injuries to the fetus or child if the obstetrician fails to exercise due care for the safety of both the mother and fetus throughout the pregnancy. Certain conditions may develop during a woman’s pregnancy that increase the risk of fetal asphyxia injuries, such as placenta previa, pre-eclampsia, and eclampsia. The proper and timely diagnosis, monitoring, and treatment of these conditions may be crucial to the prevention of asphyxia injuries to the fetus. The failure of an obstetrician to perform these functions in a proper and timely manner may, therefore, be found to constitute actionable negligence, resulting in liability on the part of an obstetrician whose negligent treatment is found to have been a cause of a fetus’s asphyxia injury. Medical malpractice during the labor and delivery stages of childbirth may also result in asphyxia injuries to a fetus or child. A child may sustain asphyxia injuries if, for example, an obstetrician negligently fails to monitor, recognize, and appropriately respond to signs of current fetal distress or indications of the possibility of fetal distress. These signs or indications may include an erratic fetal heart rate or problems with the placenta. When such negligence is determined to have been a cause of a baby’s asphyxia birth injuries, the obstetrician may be held liable for the damages suffered by the baby as a result of his or her asphyxia injuries. Improper or inadequate care by obstetricians and other medical personnel immediately following a child’s birth may also result in asphyxia injuries to a child. If, for instance, a baby exhibits signs of breathing difficulties, pale skin, or loss of consciousness immediately following birth and the failure of medical personnel to timely and appropriately respond to the baby’s condition is found to have resulted in an asphyxia injury to the baby, such medical personnel may be found liable for the baby’s injury in a medical malpractice action. If your child has suffered from a non-fatal birth asphyxia injury or has died as a result of asphyxia before, during, or after childbirth and you suspect that your child’s injury or death was due to the negligence of medical personnel who cared for you during your pregnancy or assisted in your child’s birth, you may be entitled to compensation for the injuries you and your child have suffered as a result. 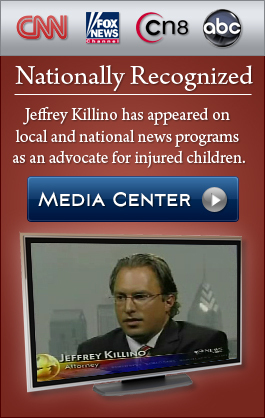 Birth injury lawyer and asphyxia lawyer Jeffrey Killino is well known for his dedication to holding medical professionals responsible for the injuries and deaths caused to children as a result of their negligence or malpractice. Contact attorney Killino at 877-412-8490 for compassionate yet aggressive assistance with your case.